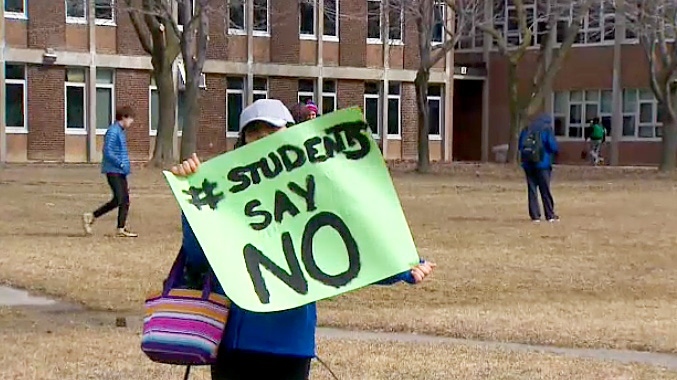 Thousands of students across Ontario walked out of their classrooms on Thursday afternoon in protest of the provincial government’s changes to education. More than 700 schools signed up to take part in the mass protest organized by the student group, March for our Education. An estimated 200,000 elementary and school students were due to participate in the hour-long demonstration, which kicked off at 1:15 p.m. 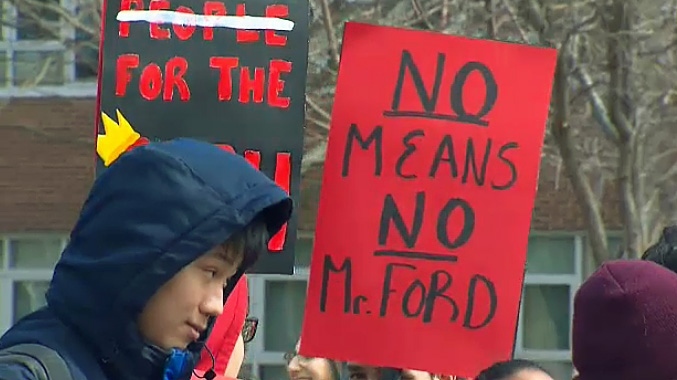 Carrying signs and chanting ‘Doug Ford has got to go,’ students at Bloor Collegiate Institute and Sir Wilfred Laurier Collegiate gathered on front lawns at 1:15 p.m. to demand change. Meanwhile, the student-led protest flourished on social media, where many participants used the hashtag #StudentsSayNo to draw attention to the demonstration and the cause. The province-wide protest was organized in opposition of the recent changes to education announced by the Progressive Conservative government led by Premier Doug Ford, including mandatory online courses, a cellphone ban in classrooms and the projected loss of teaching positions due to increased class sizes. The ministry of education responded to the walkouts and potential loss of teaching jobs on Thursday evening. Beginning this fall, 1,558 positions are expected to be phased out through attrition and voluntary packages followed by another 619 in 2020-2021, 738 in 2021-2022 and 560 in 2022-2023. “Doug Ford and Lisa Thompson want to cut $1.4 billion from Ontario’s education budget. I have a question for everyone in Ontario – Are we going to allow this? Are we going to allow this man – a college drop out after only two months – and this woman to destroy public education?” Victoria, a Grade 10 student at Bloor Collegiate Institute asked the crowd of students and supporters on Thursday. “It’s very unfortunate that our education is being limited because of our ability to be able to pay for our education,” Kasfia, another student, said. 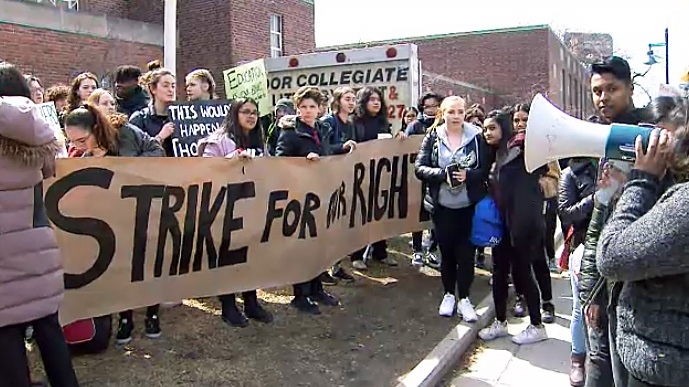 NDP education critic Marit Stiles joined the protest at Bloor Collegiate Institute and former minister of education and Liberal MPP Mitzie Hunter stood with students at Sir Wilfred Laurier Collegiate Institute. Stiles said she believes Ford isn’t taking the students seriously. Frank Hong, a student and the co-executive director of March for our Education, said the sheer number of schools involved should send a strong message to the Premier. “The message that we’re trying to get across today to the Ford government is that students across Ontario will not stand and just watch as they rip apart our education system,” Hong told CP24 on Thursday morning. Hong criticized Education Minister Lisa Thompson for comments she made yesterday about the planned protest. Thompson suggested to reporters that a walkout is not the right way to voice concerns about the government’s changes. “She’s claiming that walkouts aren’t constructive,” Hong said. Thompson clarified that while she is not against a walkout, she does not believe the forum will allow for students’ voices to be heard clearly. “We’re seeing them en masse but we’re not hearing them in a manner that we can work with,” she told CP24 on Thursday morning. In legislature on Thursday, Ford blamed the influence of teachers and unions for the mass protest. The premier claimed the walkout was driven by unions that are looking to secure better contracts for teachers ahead of their collective bargaining agreement expiring this summer. “This isn’t about class size, I’ll tell you. This is about the union bosses telling the teachers and the students what to do,” Ford said during question period. The sentiment was echoed by the education minister. “Teachers unions who are encouraging these walkouts are disrupting and distracting students across this province. Unions are using the classroom to push their ideas and push their political agenda,” Thompson said. Ontario NDP Leader Andrea Horwath was not in legislature on Thursday; however, in a statement she said she believes the PC party has “underestimated” students. Horwath commended the student organizers and participants for their leadership and passion, and said the NDP stands in solidarity with their efforts. “Politicians often say that students are the future or the leaders of tomorrow. Not you. You’re the leaders of today. You’re the people that are fighting for what’s right, right now. You’re fighting for yourself, for your teachers, for your classmates, and for Ontario,” she wrote. The PC government’s overhaul of the education system includes major changes to elementary and high school class sizes. Under the reforms, high school classes would grow from 22 students per teacher to 28 students. Grades 4 and 8 would see the addition of one more student, bringing the average class size to 24.5. A preliminary memo sent to Toronto District School Board (TDSB) trustees earlier this month suggested the sweeping changes could lead to the loss of approximately 800 high school teaching jobs in Toronto. Grades 4 to 8 could see 216 fewer teachers. The move has garnered criticism from school boards and educators, as well as parents. TDSB Chair Robin Pilkey said the changes will mean students won’t get the attention they need and deserve. School boards in Peel Region and Toronto recently wrote to Thompson with concerns that changes to class sizes will diminish elective course options, like arts and skilled trades. Pilkey said elective options will disappear while schools restructure with fewer teachers. Prior to the walkout, a “Walkout Organizer’s Guide” was provided to schools and student organizers who planned to participate. The guide offered best practices for a peaceful protest. As for what comes after the rally, March for our Education organizer Frank Hong said the work doesn’t end there. Students are being asked to write letters with their parents to their local MPPs to show the scope of the support. Students at Bloor Collegiate Institute participate in the province-wide walkout against the Ford government's changes to education on April 4, 2019. A student holds a sign outside Mackenzie William Lyon Mackenzie Collegiate Institute in Toronto on April 4, 2019. Students at William Lyon Mackenzie Collegiate Institute participate in a protest against Premier Doug Ford's changes to education on April 4, 2019.